Of note for Defence today are reports about a UK peacekeeping deployment to South Sudan and claims about operations in Syria. BBC News carries online an article that a small team of UK military personnel have arrived in South Sudan to support a UN peacekeeping mission. The article references that up to 300 UK troops will be sent over a number of deployments, which will see them provide vital engineering work to strengthen infrastructure as well as further advisory support. The article adds that around 70 UK personnel will deploy to Somalia as part of the wider contribution to UN peacekeeping. The arrival of British personnel clearly demonstrates our commitment to supporting UN efforts to improve conditions in some of the world’s most destabilising conflicts. Read more about this deployment here. The Times reports claims that British special forces are on the front line in Syria defending a rebel unit from Daesh attack. The Sun also carries the story in brief. It is our longstanding policy that we don’t comment on Special Forces operations. There is follow-up from The Sunday Times in The Telegraph, Daily Express and Daily Mirror about claims that the UK Border Force has been in contact with the MOD about the possibility of the Royal Navy assisting with Channel patrols. There is currently no request for military support in the English Channel. The Times newspaper follows up on yesterday’s Mail on Sunday report that a Household Cavalry soldier has been arrested by military police after allegedly trying to make a bomb and creating illegal firearms. These allegations are the subject of an ongoing Royal Military Police investigation; we are unable to comment further. 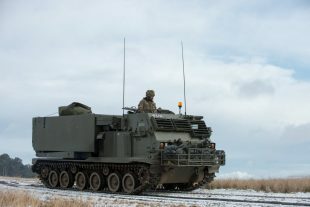 Gunners from Army Reserve unit 101 (Northumbrian) Regiment Royal Artillery and 1 Regiment Royal Horse Artillery (1 RHA) exercising in Otterburn Ranges in the North of England. Pictured is a Multi Launch Rocket System (MLRS). Crown Copyright.